Cotton Candy used to be called Fairy Floss! 200 million individual Skittles are made every day! In the summer over half of all marshmallows sold end up being toasted over a fire. When E.T. was released, sales of Reese’s Pieces went up over 65%! Tootsie Rolls were once marketed as a “health food”. In 1953 it took 27 hours to make one Marshmallow Peep! Today it takes 6 minutes. The sugar in candy isn’t what rots your teeth. The “streptococcus” bacteria in your mouth like to munch on sugar. The acid they excrete can give you cavities. Americans purchase nearly 600 million pounds of candy a year for Halloween. 48 million pounds during Valentine’s week. The Curtiss Candy Company, which renamed its candy bar from Kandy Kake to Baby Ruth in 1921, claims its famous chocolate was named after Grover Cleveland’s daughter Ruth and not after baseball legend Babe Ruth. Over 10% of annual candy sales happen the days leading up to Halloween — that is nearly $2 billion dollars in sales. Chocolate is clearly the preferred choice of sweets for many. Of the $1.9 billion sold in Halloween candy each year, $1.2 billion was on chocolate candy and only $680 million on sugar candy. The top selling candy: Candy Corn. 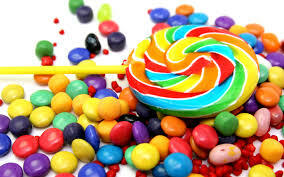 Americans purchase over 20 million pounds of it a year, though it is unlikely that every last one of those millions of candies was actually consumed. After the beloved Candy Corn, the leading best sellers are as follows: Snickers, Reese’s, Kit Kat and M&M’S. When eating candy canes, boys were almost twice as likely to crunch their candy canes than girls (31% vs. 17%). Candy Corn is the most searched-for candy term in Google — more popular than candy apples, gummy worms and candy pumpkins. Searches for Candy Corn are up 10 percent from October 2010. Out of all 50 states, Alabama searched for candy corn the most! Which state searched the most for organic candy? Colorado. Oregon searched most for gluten-free candy and Kentucky took the lead in sugar-free. The winter holidays are the largest "candy holiday" sales season, followed by Easter, Valentine's Day, & Halloween. This Halloween more people are searching for gluten-free candy than sugar-free candy. Google searches for gluten-free candy are currently 20 percent higher than searches for sugar-free candy. The day of the year with the most candy sales? October 28th. And of all the 365 days in the year, the top five candy selling days are all in October. Even though the economy is tightening everyone’s budget, that does not stop them from splurging a bit on this one holiday. The average American household spends $44 a year on Halloween candy! When kids ages 6-11 years old eat candy, they prefer chocolate candy two-to-one over candy that doesn't contain any chocolate. The founder of Hershey’s Chocolate started his candy making business at just 18 years old! Two different universities created machines to see how many licks it took to get to the center of a Tootsie Pop. One took 411, the other 364. Peppermint Patty from the “Peanuts” comic strip was named after Charles Schultz saw a dish of the candy sitting on a table.